In re Newell, 891 F.2d 899, dealing with the patent issue of obviousness. 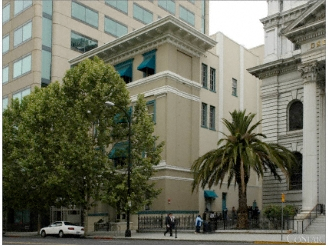 We are located in downtown San Jose, one block south of the Fairmont Hotel and adjacent to St. Joseph’s Cathedral, partly seen in the picture. Our building was formerly the site of the main San Jose telephone exchange and previously the historic Pacific Hotel, of which there is a 2/3 scale replica in the San Jose History Park. Validated parking is at any City operated parking facility, such as the Market St. Garage at 55 N. Market St. Parking meters are enforced from 9 a.m. to 6 p.m. and require coins or credit cards. Other lots and garages are available but not validated.